One girl. Magically transported to another realm. Seven hunky men wearing mysterious masks adorned with ancient symbols and scripts. What could go wrong? My name is Alfie. A university student. I'm nothing special. Just your average nineteen-year-old girl doing her best at life. Then that happens. When I first set foot on St. James Manor, a charming old house my parents bought and turned into a retreat for writers, I feel a sense of connection with the magical place. One night, while I bathe in the hot spring that is on the estate, I'm inadvertently transported to another realm. Disorientated and afraid of my new, mysterious, and foreign surroundings, I'm found by two dark warrior lords, who mistake me for a boy because of my short hair and slender frame. They even suspect that I am a member of a loose, violent bandit that is raiding their kingdom and kidnapping the civilians. Despite having a fun and adventurous soul, I find nothing exciting, as these two gorgeous warriors take me back to their camp and proceed to grill me about my background; especially when one, tsundere Caleb, couldn't stop staring at me, while the other, gregarious Felix, treats me like his next love interest and pays me his undivided attention at every possible chance he gets. When a group of bandits pursues me and I am lost in the wild, dangerous woods, an alluring vision-in-white of a lord appears. His name is Geoffrey, and his enthralling charm fascinates me. Of course, all that I want is to return home. But little do I know that finding a way home is the least of my worries, because there are four more gorgeous men, as well as a whole new, fantastical kingdom out there, waiting for me. 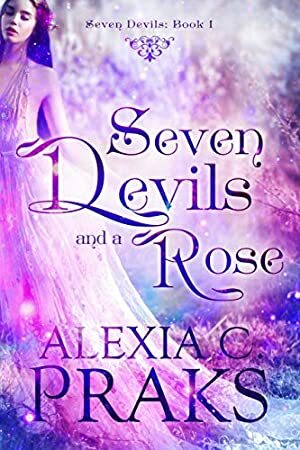 Seven Devils and a Rose is a reverse harem fantasy fairy tale romance where paranormal creatures exist, magical power and technology go hand in hand, and love is a forever thing. Track It. This book has been $0.99 within the past 90 days. Log In to track Alexia C. Praks on eReaderIQ. to be notified each time the price drops on any book by Alexia C. Praks. to stop tracking Alexia C. Praks. Log In to track Alexia Praks on eReaderIQ. to be notified each time the price drops on any book by Alexia Praks. to stop tracking Alexia Praks. We started tracking this book on November 7, 2018. The price of this book has changed 5 times in the past 166 days. The current price of this book is $3.99 last checked 23 days ago. The lowest price to date was $0.99 last reached on February 10, 2019. This book has been $0.99 2 times since we started tracking it. The highest price to date was $4.99 last reached on November 7, 2018. This book has been $4.99 one time since we started tracking it. We last verified the price of this book about 23 days ago. At that time, the price was $3.99. This price is subject to change. The price displayed on the Amazon.com website at the time of purchase is the price you will pay for this book. Please confirm the price before making any purchases.